Receipts were 523, including 105 packer cows, bred cows and pairs, 418 yearlings and calves. Packer cows were steady to $5 higher. Packer bulls were steady to $6 higher. The replacement bred cows and pairs were steady on a light test. Market on steers and heifers weighing 500# and under were $8 to $10 lower. 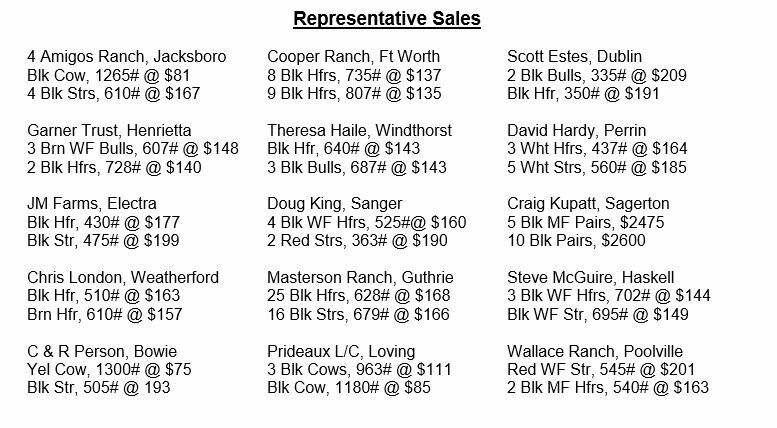 Feeder steers, bulls & heifers weighing over 500# were $3 to $5 lower. We had a light run today due to the good rains but the cattle were cheaper due to the board being down. Receipts were 1592, including 410 packer cows, bred cows and pairs, 1182 yearlings and calves. Packer cows were $4-$6 lower. Packer bulls were $5-$10 lower. The replacement bred cows and pairs were $100 to $200 higher with a good demand. Market on steers and heifers weighing 500# and under $5 to $6 lower. 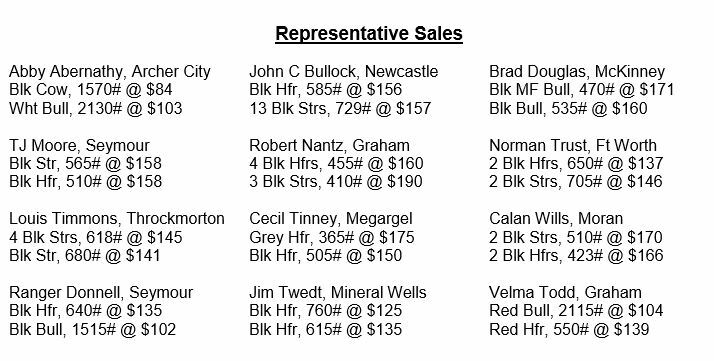 Feeder steers, bulls & heifers weighing over 500# were $5 to $8 lower. The market was cheaper on all classes of cattle. Receipts were 1315, including 266 packer cows, bred cows and pairs, 1049 yearlings and calves. Packer cows were steady. Packer bulls were steady. The replacement bred cows and pairs were $100 to $150 higher. Market on steers and heifers weighing 500# and under $2 to $5 lower on the new crop calves, steady on the conditioned calves. Feeder steers, bulls and heifers weighing 600-650# were steady. The 750-900# yearlings were $3-$5 lower. 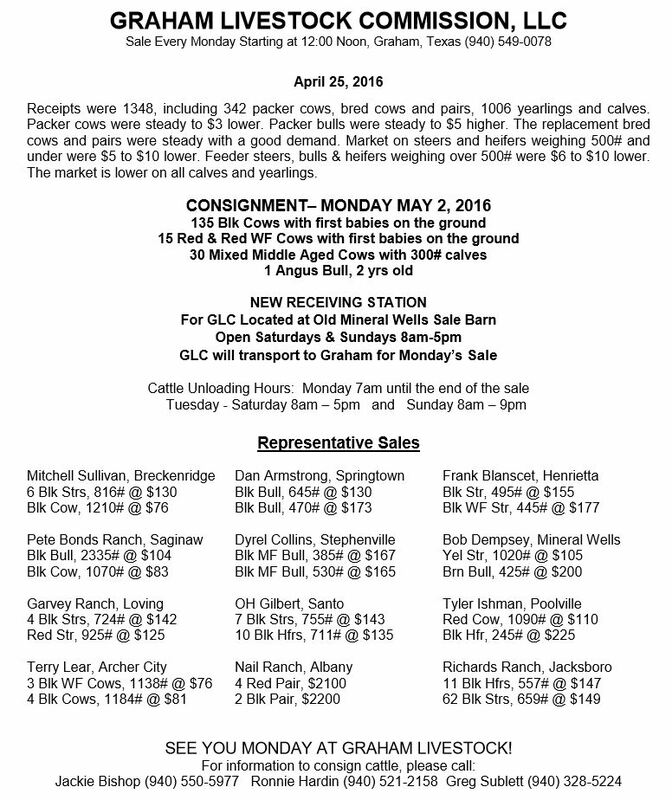 The lighter weight cattle were steady with a good demand. The heavy weight cattle were cheaper.